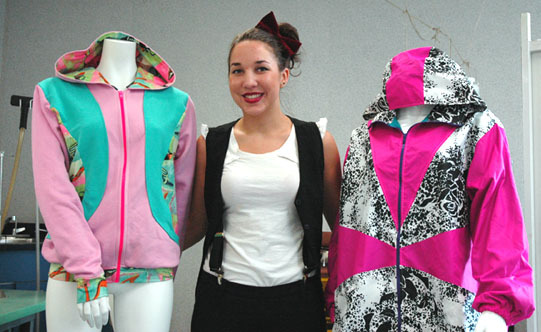 Fashion is not all glitter and glamour at Kwantlen. Andee Jasper, a third-year fashion design student, has learned that becoming a fashion designer isn’t as easy as it was fantasizing about. “Coming into the program was an eye-shocker. It’s marketing… You don’t just make a pretty gown and put it on a model and take a picture and think you’re a designer,” said the 20-year-old Jasper. Kwantlen’s Bachelor of Design, Fashion & Technology program is the only one of its kind in western Canada and has become known as a prominent stepping-stone to get eager students into the industry. “Kwantlen is known for their niche markets… and that’s why we get jobs and that’s why we start our own businesses,” she said. Throughout the four-year degree program, fashion students acquire the marketing and production that lead to The Show, which is put on by all fourth-year students at the River Rock Casino Resort Theatre and which attracts hundreds of employers in the Vancouver fashion scene. “Everything we learn goes into fourth year,” Jasper said. Jasper’s career goal is to start her own clothing line, common to many aspiring fashion designers, but from her experience at Kwantlen, has understood that it won’t happen right out of university. “I know the amount of work that goes into it… so I’ll slowly build up to it,” she said. For now, Jasper continues to work hard, spending almost her entire days at the Richmond Campus in the design classrooms or the computer lab, and preparing for her internship next semester.